Admittedly, this is a strange pick, because it doesn’t actually touch on Hanukkah at all, although it does describe in great and fascinating detail the family rituals surrounding other Jewish holidays, like Passover and Sukkot (Hannukah shows up in a later book of the All of a Kind Family quartet, More All of a Kind Family). 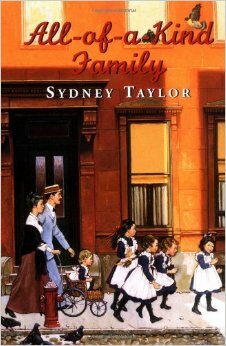 But I can’t resist giving a plug to this first of Sydney Taylor’s heavily autobiographical titles describing early 20th century life on the lower east side of Manhattan—first introduced to me by librarian extraordinaire Lisa von Drasek, then of Bank Street. It’s been in near-constant rotation with my daughter since I brought it home three years ago and sadly, is the only book of the four still in print. 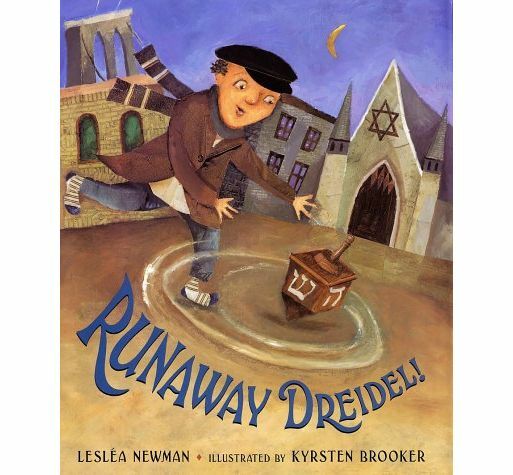 Runaway Dreidel! is illustrated by Kyrsten Brooker and readers of this blog will hopefully recognize her name. That’s because she’s also the illustrator of The Honeybee Man. Both books, Leslea Newman’s and my own, feature Kyrsten’s charming collage-style illustrations and yes, her renderings of the Brooklyn Bridge (not that I’m biased in favor of the borough or anything)! Because yes, I have a food fetish and yes, a large part of that fetish involves potatoes, especially if they are warm and crispy. We didn’t make latkes at my house; my mother made big, German-style potato pancakes—just a thin layer of the grated potato and salt cooked over a high flame in a large cast iron skillet until dark brown on both sides. I’ve recreated her recipe from memory for more years than I care to admit here but recently I came across the latke recipe of my dreams, in Yotam Ottolenghi’s cookbook Jerusalem. No, the secret ingredient is not love, or magic, or the togetherness of family—as it probably is in a lot of excellent latke recipes. It’s parsnips. Yum!